Such a long wait, but we're on our way back. I fear the telephone lines will be down so it's possible there will be no internet access for a week or two after Monday, which means no blogging but you won't miss me, I'm sure. 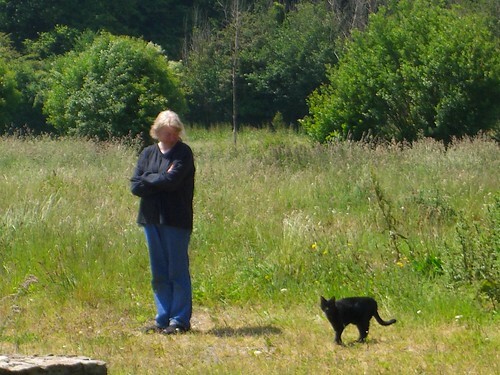 The picture above was taken when the cat and I first moved into the lovely farm which is our home, way back in the spring of 2006. I'd been before for a week or two at a time on my own but it was with fear and severe trepidation that I contemplated living there alone for months without any companions other than that faithful old cat. Now, after nearly three months of self inflicted residence in the UK I can't wait to get back. Today I'm getting the white car serviced, and must write another enormous list of things to take, most of which will not fit into the space allowed, the small area not taken up by the accoutrements of an old and incontinent cat whose comfort must come first. I'm extending invitations far and wide to friends, acquaintances, even strangers in the street to come over and see me sometime, with or without life jackets in the hope of having some visitors to share a bottle with. I'm trying not to be sad that Paul won't be able to spend much time with me, it's the hardest part. So many projects will fill my time - there is at last some chance that we can start renovating at least one of the buildings so a priority will be to get plans and quotes organised there. The garden will need a lot of attention, I have almost no money to live on so must try to grow as much food as I can to keep valuable cash for our cat food and wine ration. I hope to complete a dozen paintings and to lick the cookery book into some sort of shape - but mostly, I'm hoping for summer and swallows and the quiet hum of the countryside around me again. it sounds as though you are living the life so many of us dream of! i hope things go well for you. Thank you, I know I'm very lucky.